Putting organic matter back into the soil has a number of benefits. Some of these include the enhancement of soil structure, a buffering effect against pH extremes, reduced leaching of nutrients, and more favorable conditions for microorganisms and subsequent nutrient cycling. Plant biomass, from crop residues or green manure/cover crops (gm/cc’s) is an excellent source of organic matter. 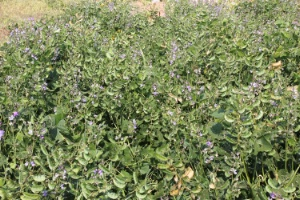 ECHO’s research in South Africa has included a leguminous gm/cc screening trial. In that trial, one of the treatments is a natural fallow control in which native plants/weeds are allowed to grow. It has been interesting to compare the nutrient content of legumes versus a mixture of broadleaved weeds and grasses in the natural fallow plots. Year two was quite dry, with less than 500 mm of rainfall. Under those conditions, lablab was our top performing gm/cc species. By the second month after planting the gm/cc’s, the 6.6 t/ha (dry weight) of above-ground biomass (leaf and stem tissue) in the natural fallow control was statistically similar to the 6 t/ha obtained with lablab bean. We were a bit disappointed that none of the gm/cc’s surpassed the natural fallow, but it was at least encouraging that there was a gm/cc species out there that could produce just as much organic material as a weedy fallow. Most interesting, though, was the fact that lablab vines accumulated 123-132 kg N/ha, which was statistically greater than the 85 kg/ha of N accumulated with natural fallow plants. So, not all plant biomass is equal. Leguminous gm/cc’s have the advantage of being able to fix their own N, taking atmospheric N and converting it to plant useable forms. That could have a lot to do with why nitrogen concentration in lablab (2.2%-2.7%) plant tissue was nearly twice that in natural fallow plants (1.3%). Nitrogen isn’t the whole package though. We’ve seen P and K levels in natural fallow plants that have equaled or exceeded levels with the various leguminous gm/cc species in our plots. In the same plots as mentioned above, the natural fallow biomass averaged 2.7% K in comparison to 2% with lablab. Pictured here is one of our lablab plots. By the 6th month after planting gm/cc’s, lablab biomass production reached 13 t/ha (containing 252 kg/ha N), higher than the 8.2 t/ha (containing 143 kg N/ha) with natural fallow. We are leaving all that biomass on the soil surface and will be measuring its effect on soil fertility and biology moving into the next growing season. Notice the huge number of pods on these plants! This plot was Lablab purpureus ‘Highworth’. We selected ‘Highworth’ because it is known for earliness, which was important to us considering the cold South African winters.